New American Express Membership Rewards Transfer Bonus – 24,000 Points One-Way to Europe! Here’s a bit of exciting news for folks who have accumulated a decent amount of AMEX Membership Rewards points. Until November 30, 2018, you can get a 25% bonus when you convert AMEX Membership Rewards points to AeroMexico points. But this transfer bonus works a bit differently than your typical AMEX Membership Rewards bonus offer. I love flying on AeroMexico. Flights are almost always on time, the airline seems very organized, the planes are modern and comfortable, and you can find great deals frequently (like this one) if you keep an eye out. Pack Your Bags and Book a Flight From the US on AeroMexico for a Winter Getaway! So what’s the deal? Take a look at the details of this offer to find out if you can benefit from moving some of your AMEX Membership Rewards points over to AeroMexico. Given that AeroMexico already offers a 1:1.6 conversion ratio for AMEX Membership Rewards points (1,000 AMEX points = 1,600 AeroMexico points), a bump of 25% means that you’re getting a transfer ratio of 1:2 (1,000 AMEX point = 2,000 AeroMexico points). That’s a pretty solid exchange rate, if you ask me! I’ve flown AeroMexico many times when traveling through Mexico, but I haven’t thought to check their flight schedule from the US. Now is a good time to dig a bit farther into that. Where can you actually fly from the US with AeroMexico rewards points? I found this helpful schedule on their website. Here’s a chart that shows the number of points you’ll need to fly on AeroMexico’s partner airlines to various destinations around the world from the US. 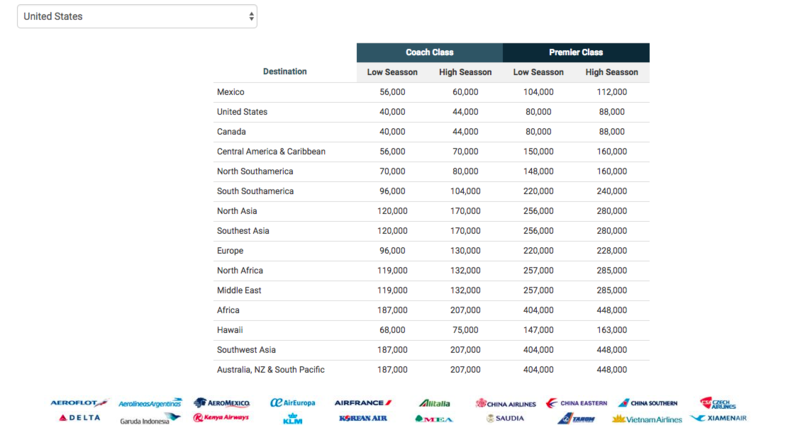 You can also see a list of AeroMexico’s SkyTeam partners at the bottom of this chart. Look at All of the Places You Can Fly From the US With AeroMexico Points! So, if I’m doing the math right (and admittedly, math is not my strongest skill) it looks like you can fly from the US to Europe during low season for 96,000 AeroMexico points round-trip in coach. Which means that you would only need to convert 48,000 AMEX Membership Rewards points over to AeroMexico to book this flight for free. That also means, for new AMEX cardholders, you might already have enough points from your initial bonus offer to book a free flight now. For example, when you apply for The Platinum Card® from American Express, you can earn 60,000 AMEX Membership Rewards points after spending $5,000 on purchases with your card in the first 3 months of account opening. This is a bonus that AeroMexico is offering, so you’ll actually need to start by registering with your AeroMexico Premier Club membership number. If you don’t currently have one, you can enroll here. Go to the AeroMexico Club Premier website and enter your membership number to sign up for the promotion. Either call 800-AXP-EARN or go here online to request a transfer of AMEX Membership rewards points. You must transfer at least 1,000 AMEX points. Check to see when your points post to your AeroMexico account. It can take up to one business day (sometimes longer). Once your points are available you can book your flight! A few things to remember with this offer – it’s only valid for US residents. It expires on November 30, 2018. And AeroMexico does add fees (such as taxes and fuel surcharges) when you book a flight with points. And in some cases the additional fees make AeroMexico award flights a bad deal. You also can’t book award flights online, so you’ll need to call in to use your points. Also, with this offer you won’t see the bonus listed on the AMEX Membership Rewards site because it is an AeroMexico promotion. So you’ll get the bonus after you make the transfer, just be sure to register first. Want to Start Accumulating AMEX Rewards Points? If you’re feeling a bit left out because you don’t actually have any AMEX Membership Rewards points right now, take a look at these cards to figure out which one makes the most sense for you. Currently, I’m using the American Express® Gold Card and I love the flexibility it provides. I’ve already flown to Panama, San Francisco, and Chicago within 2 years of getting this card. 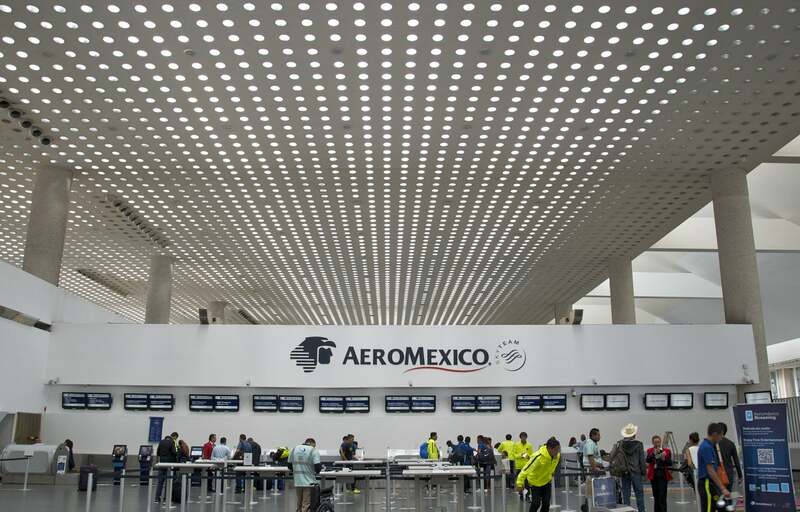 Did you go through the process to convert your AMEX points to AeroMexico? How are you planning to use these points? Let me know in the comments section below!